100 x SPDT slide switches. There is a hole for installation at each end of the switch. Suitable for a wide range of applications. Size(L x W x H): Approx. 19 x 6 x 13mm. Color: Black. Current: 0.3A. 100 x SPDT slide switches. Suitable for a wide range of applications. Size(L x W x H): Approx. 19 x 6 x 13mm. There is a hole for installation at each end of the switch. They are essential parts for DIY. 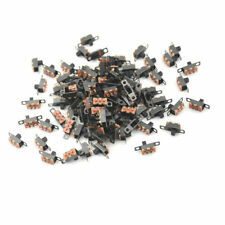 100 x SPDT slide switches. Suitable for a wide range of applications. Size(L x W x H): Approx. 19 x 6 x 13mm. They are essential parts for DIY. Current: 0.3A.